OP is looking to buy a piece in the $30k range, he was just showing his current collection to help with the decision. At $30k, we are definitely talking about a high end purchase, in the realm of Patek, ALS and else. Correct. People need to learn how to read. I didn’t say my collection was high end. I said I was looking for a high end piece. I really like the Patek 5396. It’s about 40k but it’s one of my top choices. Thanks for the suggestions. Iliteracy and wealth are not mutually exclusive. I recently traded this in. 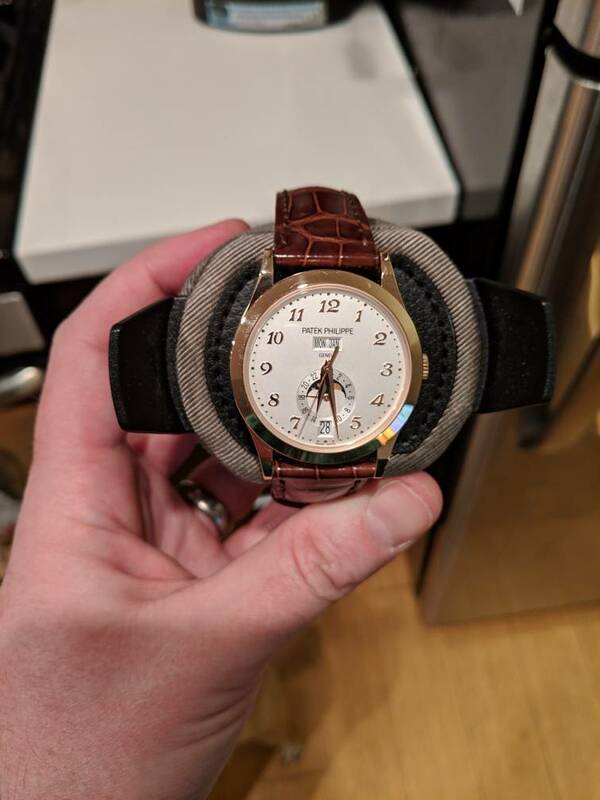 A beautiful watch but I just didn't wear it much so it was a waste for me. I would definitely recommend one and can point you in the direction of a good one for a decent amount less than $40k if you decide to look closer. calvincc and MZhammer like this. OP sorry. i wanna make suggestion. why not getting a BLANCPAIN FIFTY FATHOMS MILSPEC ?? you are sport watch lover. if not, get the vacheron constantin harmony dual time. or what about ALS DATOGRAPH?? iconic and dressy and sporty at the same time. first, you need a watch with a white dial to complement your all black dials. second, you need a watch on a leather strap (rubber is an option but it is sporty and you are not lacking at all in the sporty Dept). Fourth, it looks to me like you are a person who likes watches that have s purpose (Chrono, Diver, GMT) so you might think of an annual/perpetual calendar. if i were you, i would sell the explorer and the sub and get me a PP-5146 or a PP-5396. Up the budget and go for Nautilus, don’t look back. I actually like the royal oak more than the nautilus. I don’t have a dress watch and I do want to add some complication to my collection. The Sub is a great choice, its goes with everything and comes in a perfect size. If you hadn't made the patek only rule I'd say get the jlc chocolate reverso in gold. You like black dials, it's a variation while still staying where your comfy. While you could get something more this is going to be your first time wearing a gold watch. It might not be for you. It's not a tank like your rolexs, nor as cheap to fix. A time only piece is far better to have for special occasions/days than a complicated piece. It's easier to pull from storage, wind, and go on. If you find yourself wearing it every day, and being ok with its huge reduction in reliability, go for something more.